Reaching the water section of the Fane we battle killer fungus and water weirds, and parley with a tribe of lizardfolk. Then it’s on to the Temple of the Crushing Wave! What do you do when you a have a string of interconnected dungeons, all of a different level, and no built-in way to stop your players from stumbling into them? Sit back and watch the chaos unfold. When it comes to DMing, I’m far better at planning than ad-libbing. My skills at rolling with the punches have steadily improved, and it’s a very necessary skill to have to run a tabletop RPG. That being said, I try to see where players are and what’s ahead and plan accordingly. These last few sessions have been extremely difficult in that regard, due to the dungeon layouts in “Princes of the Apocalypse.” I’m having to construct entire large dungeons every week as my party hops through them haphazardly. It’s fun to see which directions they take (seemingly at random!) but hell on my stress levels. 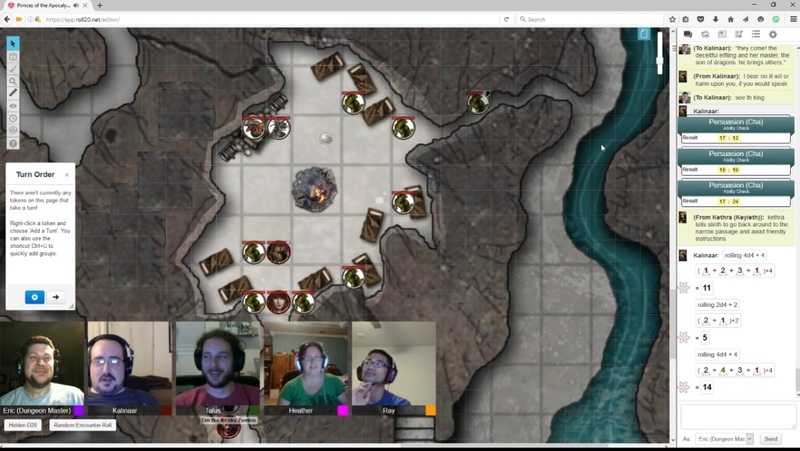 This week my PCs continued their dangerous sojourn within The Fane of the Eye. I was prepared for most of the paths they would go, and thankfully they took one of them. I did not necessarily expect them to circle around to the water corner, but thankfully they also reached the room I had prepared the most – the Blackmaw Tribe. Before that they stumbled into a mushroom cave. Since mushrooms = very bad in the Phandelver cave they approached cautiously. Only a few weak violet fungus impeded their progress, and the one Grell that tried to ambush them went down ridiculously quickly. The Blackmaw Tribe have some interesting role-playing possibilities, which were almost completely screwed up thanks to Kethra. Granted, a room full of lizardfolk is typically cause for alarm. In this case they actually have a motivation and goal to overthrow the current leader of the Crushing Wave. I decided to write in Kalinaar as a prophecy that he would help them – giving the lizardfolk a reason not to immediately attack the PCs. Kethra nearly screwed things up anyway, which I find delightfully funny, but probably irritates the rest of the party. As the chaotic rogue her shenanigans often get the party in to trouble as much as she bails them out. She’s a DM’s best friend, always springing traps and opening doors. She attempted to roll the tornado orb from last week into the room – but the orb needs someone to touch it to activate. A bit more clever planning will need to be involved. Not to mention that the lizardfolk only camp a few rooms over – they probably know exactly how it works. Kalinaar accepted the parley. I quickly learned that while whispering to individual players can be fun for a few bits of info, trying to do entire scenes that way just doesn’t work, and understandably frustrates the rest of the party. Lesson learned! Kalinaar was willing to work with them, and I played up the shaman’s diplomacy with the lizard king’s bravado. Kalinaar kept succeeding on multiple Persuasion checks, which lead to his party receiving all the spoils, and only having to fight a lizardfolk instead of the king himself to prove his prowess. Meanwhile Kethra had Charmed one of the lizardfolk and nearly destroyed their diplomatic relations. I could’ve had things devolve (and had planned for such an event) but given Kalinaar’s successful speech checks and role-playing, Kethra got off with a warning. Outside the cave in a large pool a pair of Water Weirds caused some concern for Kalinaar. He and Miri battled near the water while the others were still scouting the Blackmaws. Thanks to Miri’s Fist of Unbroken Air, a grappled Kalinaar was pushed further into the water, putting him in a tricky situation. His superior strength got him out of the water safely, but he took a lot of damage from the Weirds, and was in the process of drowning before Talus and Kethra showed up to help. 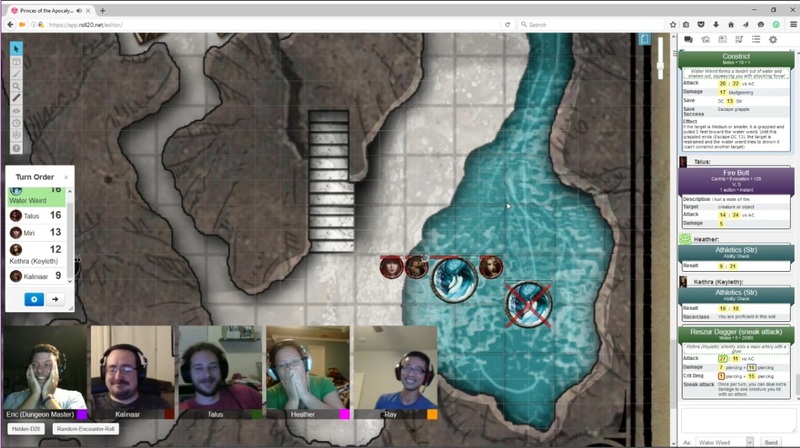 Kethra went into crazy hero mode, diving into the water and stabbing the Water Weird on a massive Crit – 39 damage! The Water Weird actually had about 40 something HP remaining but I loved the player’s role-playing and result so much I gave him the insta-kill, and Inspiration. Easily my favorite pic of D&D. THIS IS MY SHOCKED FACE! The lizardfolk agreed to meet the PCs up in the temple proper to help with the battle against its current leader, Gar Shatterkeel. 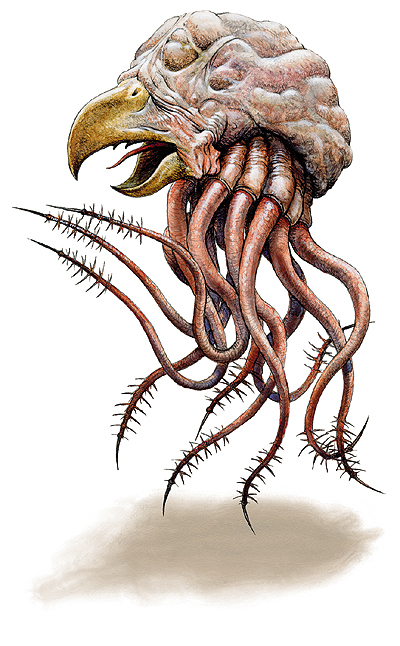 First they had to climb the stairs and deal with the insectoid guardian (a Mezzoloth). I played it up as a fierce foe but have learned, after many battles, that a single powerful foe goes down awful quick to a well-rested party of four. Oh did I mention they Long Rested in the Blackmaw’s lair? That may have been too generous, but damn Kalinaar and his 20+ Persuasion rolls! Allowing them to Long Rest in these dungeons (this is the second time now) keeps them down here for quite awhile. But, I like the direction this is going. We’ve completely switched gears from Air to Water (Miri’s mom anyone? ), and the PCs have made it this far without anyone going down (though many have come close). I’ve been prepping the air cult for so long now I have to suddenly switch to the water guys. But working with the Blackmaw Tribe and having a set goal makes things much more interesting. Look for the action next week when we take on our third dungeon in a row in the Temple of the Crushing Wave!